Is Cancer Trying to Help Us? I recently signed a card for a friend of mine battling cancer. I wrote, “Fight that fight. We are all in your corner.” That kind of language is inherent in our current understanding of cancer. Our own cells have betrayed us by mutating and dividing uncontrolled, and then spreading the rebellion all over the body. But what if cancer is an effort on a cell’s part to help us? 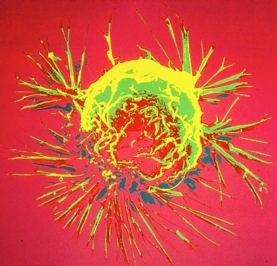 That is a new vision of cancer coming to us from researchers at Arizona State University. They propose cancer arises when cells are distressed, by aging-related or environment-related damage, and return to their immortal state. That’s right, unicellular organisms can divide indefinitely are considered immortal. Since we are a collection of cells that have evolved from unicellular organisms, maybe damaged cells are trying to return to the immortal state of a single-celled organism in order to save our lives, inadvertently endangering us. This means researchers may try new approaches to cancer treatment. Since the atmosphere had less oxygen and was more acidic during the very early years of our evolution, elevating patient’s oxygen intake and reducing sugar intake to reduce acidity in the body has been shown to shrink leukemia tumors. Immunotherapy is another effort to target cells that turn cancerous. When cells revert to more primitive selves, they lose their higher functions as cells in a multicellular organism, and may become more like the cells the immune system sets out to search and destroy. A patient is then infected intentionally with a bacteria or virus and the immune system goes to work on the infection, and possibly, the cancer. Theoretically, primitive cancer cells also have less protection against the attackers and could be killed by the infections more readily than normal cells. Immunotherapy has shown success in treating melanomas and researchers are starting to test it as a cancer treatment. New vision and treatments aside, for now, it doesn’t change our perception of cancer as a vicious invader. At least not until it can easily be cured by methods less ravaging than chemotherapy. Until then, I will still see my friend as an embattled warrior and, I hope, a victorious cancer survivor.